You may all know that a SouthIndian lunch menu is never complete without a rasam and many varieties of rasams are made each having different taste,aroma and flavour.Most of the rasam recipe’s uses cooked dhal as main ingredient!some rasam varieties are made even without the cooked dhal they are easy and can be done in less time with no compromise in taste. one such easy rasam recipe is “goddu rasam”(am unaware of the reason why it is called so but I know it is one of the traditional rasam prepared in South India) even tomatoes are not needed for this rasam!good not only for digestion but also great if we have cold.If we take it hot it will be very warming and soothingly effective during cold attacks and it is bit spicy too.The signature addition of simple spices like pepper,cumin,chillies and toordhal adds to the main characteristic of this goddu rasam. Turmeric powder – 1/2 tsp and some curry leaves and coriander leaves. 1.Dry roast pepper,cumin,chillies and toor dhal powder and keep ready. 2.Take diluted tamarind extract mix turmeric powder,salt and jaggery to it and bring it to boil and let it boil for 1 or 2 minutes. 3.Now bring to a medium flame. 4.Add powder to it,add some curry leaves and chopped coriander leaves wait till it is lightly foamy. 5.For the seasoning in a kadai add ghee and when it heats up add mustard seeds when it splutter add asafoetida,add it to rasam. 6.Now switch off the stove and close the lid. some curry leaves and coriander leaves. Dry roast pepper,cumin,chillies and toor dhal powder and keep ready. Take diluted tamarind extract mix turmeric powder,salt and jaggery to it and bring it to boil and let it boil for 1 or 2 minutes. Now bring to a medium flame. Add powder to it,add some curry leaves and chopped coriander leaves wait till it is lightly foamy. For the seasoning in a kadai add ghee and when it heats up add mustard seeds when it splutters add asafoetida,add it to rasam. Now switch off the stove and close the lid. Boil the tamarind extract at-least for two minutes till the rawness goes. Sometimes crushed garlic too are added but not necessary. Lastly close the rasam with a lid so that all the flavours are combined. 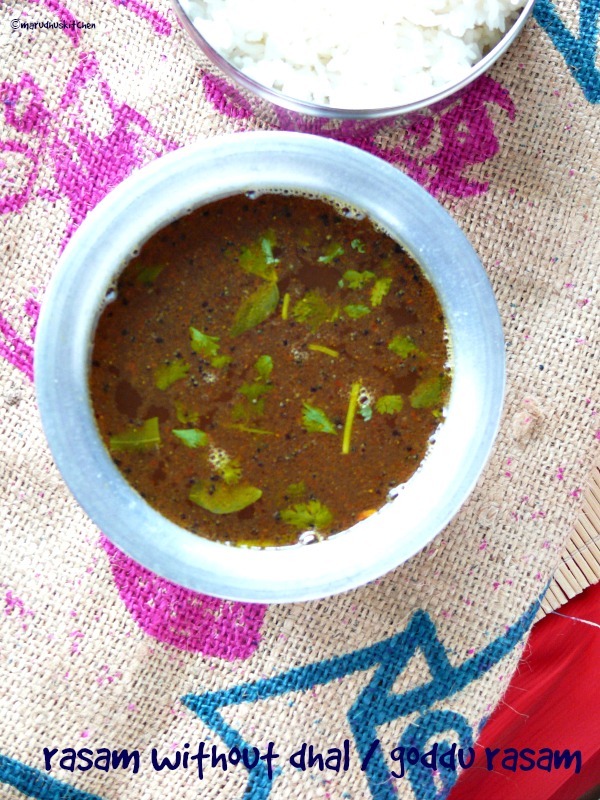 I am also posting rasam recipe today.Yes rasam is the best comfort food any south indian. Thats one hearty and comforting bowl of rasam!! lovely!! Rasam is always super comforting and this looks so delicious!! Rasam looks delicious and inviting! 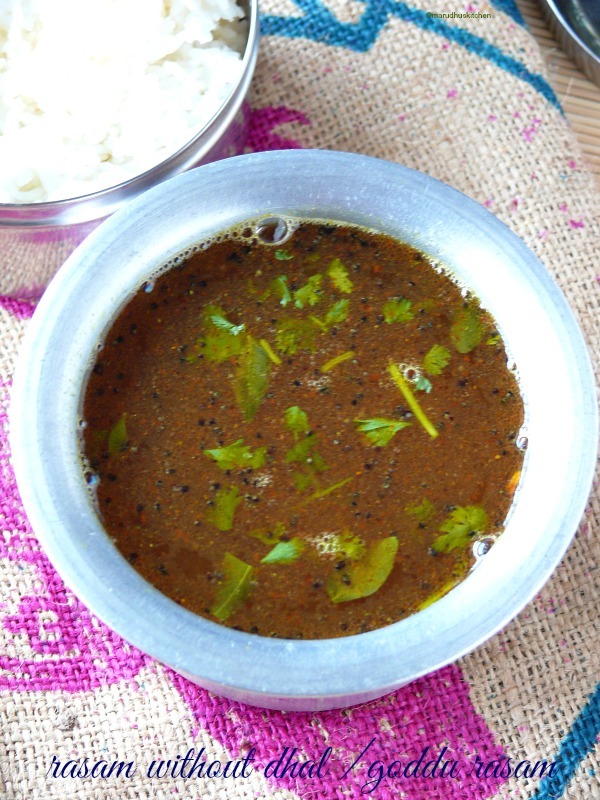 This rasam looks so delicious ! I have only tried this in restaurants and I am so glad I found this recipe in your blog. Thanks for sharing. Goddu rasam looks very attractive & delicious! Hii…made this rasam today….i had very less time …n was quite hungry…made it…n it turned out yummmm…thanks to u… I really loved it… n its soo easy to make.